These were a bit of an experiment, hashed together from a few different ideas I’d seen about the place. I may tweak the recipe further still but for now I like this one! I love crab cakes but they tend to be rather calorific (I recently saw a crab cake starter clocking in at 789 calories!!!) The idea here was to cut down on the calorie count and embrace more “eat clean” ideas in my diet. These are quick and simple to whip together and taste great! I served them here with sticky rice, edamame and tsuyu dipping sauce but they’re equally good with a bit of sweet chilli sauce. (And, yes, spot the deliberate mistake, I forgot to buy the spring onions when I cooked them in these pictures, it adds a nice aspect in both taste and colour but they work just fine without them!) These also make a nice addition to a picnic or lunchbox as they don’t fall apart! I’d even be tempted to make them into mini cakes for a picnic or party. – Boil some water and pour over the noodles in a bowl, leave to stand. – Shred the coley in to a bowl, you can use fingers or forks to gently flake it apart into small shreds. 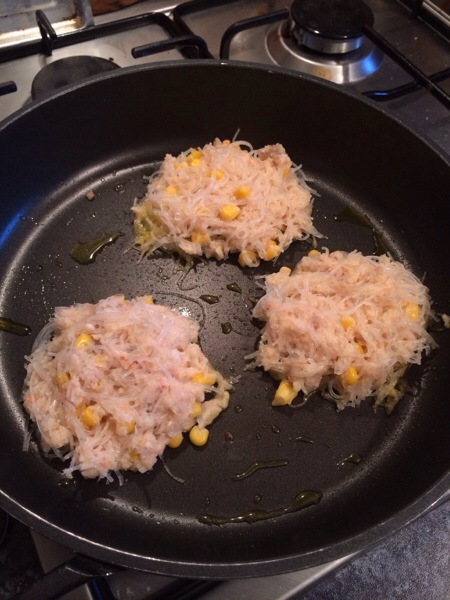 – Add the crab meat, the egg whites, the fish sauce and the sweet chilli sauce and give it a good stir. – Add the corn flour and again, stir well to combine. If the mixture is still very wet looking you can add more corn flour, you want to be able to take a scoop of it. – Drain the noodles well and roughly chop them then add them to the mixture. – Add the tinned sweetcorn and the spring onions and mix well. – Heat some oil in a large flat bottomed frying pan. – You should be able to make 6 patties out of this mixture, take a scoop, roughly shape it and place it in the pan where you can tidy up the edges a little if you like. – Leave to cook on the first side for 3-5 minutes until the cake is cooked about halfway up, you should be able to see the difference in texture as it cooks. – Carefully flip over the cake and leave to cook for another 3-5 minutes on this side without moving it. – The cakes should be dry and firm to the touch when fully cooked. – Serve with whatever sauce you prefer and may be some rice and veggies, they also go nicely with salad! This is the time of year for nibbles and canapés. 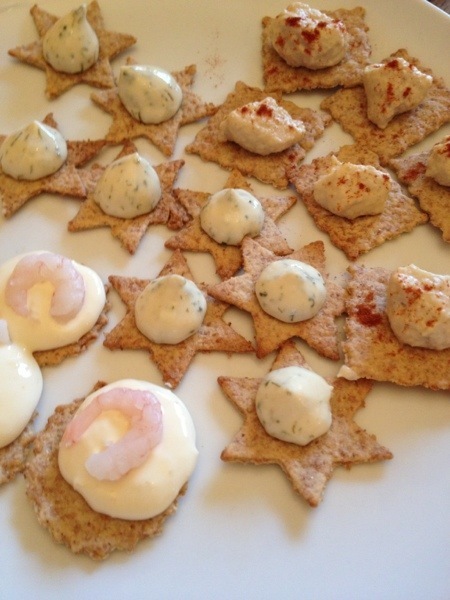 I am usually in charge of canapés on Christmas Day and I always try to make at least some effort. There are some things that are always a given. I make my Breakfast Bites with quails eggs because there would be uproar if I didn’t! I usually make something based on biscuits and that ever useful timesaver, Primula! I saw the recipe for Wheat Thins on Smitten Kitchen and, while I don’t have the first idea of what a Wheat Thin is supposed to be like, I thought they looked like a quick and simple way to make some extra effort this Christmas. They are so simple to make, quick to cook and really rather delicious! I got the craving for some nice sticky sausages too. Whenever my office get catering in they always do these brilliant sticky sausages so I thought it was high time I tried making them myself. Now, Tesco wanted to charge me £2 for itty bitty cocktail sausages… Um, no. I bought regular chipolatas for 95p and simply twisted them in the middle to get double the number of itty bitty sausages! – Take the chipolatas and twist them in the middle to make mini sausages. – Put them in an oven dish and bake for 25 minutes. – Mix the honey, mustard and soy in a clean oven dish. – Drain the fat from the sausages and snip them apart. – Put the cooked sausages in the honey mustard mix and toss to coat. – Place back in the oven for 5 minutes. 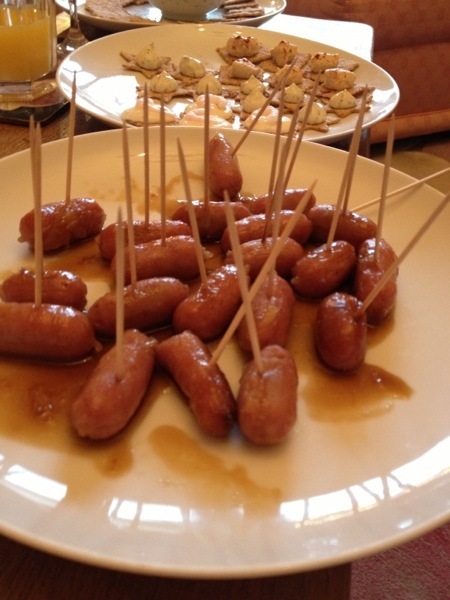 – Skewer each sausage with a cocktail stick and serve with a little of the extra sauce on the plate. – Heat the oven to gas mark 6/200C and prepare two baking trays. – Put everything except the water into a food processor and blitz until it looks like coarse breadcrumbs. – Slowly drizzle in the water with the motor running until the dough starts I come together into a ball. – Lightly flour a work surface and roll the dough out super thin then cut into whatever shapes you desire. I rolled my dough so thin you could basically see through it but they don’t have to be quite that thin! It may help to split the dough into two. – Place your cut out biscuits on a baking tray, they won’t spread so you can place them very close together. – Pop in the oven for 5-7 minutes. Keep an eye on the first batch to see how long they take to cook but whip them out the second they start to colour. – Prep the next batch while the first tray is cooking. – Put the biscuits on a wire rack to cool and keep cutting and cooking until all the dough is gone. – Top with whatever you fancy. 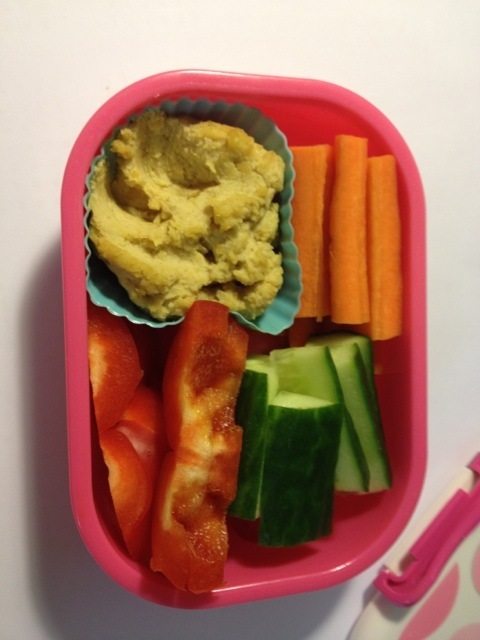 I find Primula and Houmous work well! Sorry for the hiatus guys! I’ve been working on something special though, so I hope you’ll forgive me. I have not just a recipe today but a fantastic summer menu! I am taking part in the French Wines with Style Blogger Challenge. For this challenge I was kindly sent a summer hamper with tasting notes for the wines and the challenge was to come up with some “perfect summer recipes paired with summer French wines with style”. Now, you’ll never have to twist my arm to support French wines, having spent every summer in France as a kid, I have been on more tours of vinyards than I can remember. (Best one was where the dog peed on my dad but that’s 11 year olds for ya!) I have always prefered French wines over their new world compatriots. There is just something classier about them! I love the history, the wealth of knowledge and the traditions of wine growing in France and for me that adds to the whole experience. I also happen to think they’re just damned tasty! Because that’s what it comes down to, isn’t it? Do you enjoy drinking it? If the answer is yes, then you have a winner! I will never be one for “notes of goosberry and a hint of sweaty sock” type wine drinking. I either like something, or I don’t. My stylish BBQ venue, complete with tableware handmade by my mother! The notes that came with the wines were my starting place. The words that caught my attention for the Emmanuel Delaille – Le Petit Salvard Cheverny 2010 were “goosberry and lime characters” and the suggestion that it would be a good match for “Chinese and other exotic dishes”. I immediately thought that a recipe I’d seen for fish with lime, chilli, corriander, ginger and garlic was probably a winner there. As for the Gabriel Meffre Le Cirque – Vin de France Chardonnay Gros Manseng 2011 the “peach and ginger spice” and “honey and floral notes” immediately made my mouth start watering at the thought of sticky marinated pork with peaches. 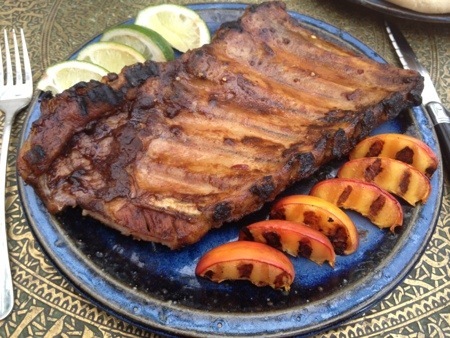 For the first course I prepared sticky ribs with grilled nectarines. This recipe and the recipe for the fish came from a Jamie Olive BBQ special in the Daily Mail but I’ve tweaked them and added my own notes here. I found that this recipe did not work at all as it said it would. It was tasty, but instead of a paste/rub this was definitely a liquid marinade. Slowcooking the ribs first was a great innovation though, and one I’ve been toying with the idea of for a while. While you can cook ribs on the grillstraight after marinading they always have a bit of a “crunch” to them. After slowcooking the meat is incredibly soft and tender and the flavour goes right through the meat. – In a large baking dish or roasting tray big enough to fit all of the ribs, mix all of the marinade ingredients together. Just dump it in then whisk it up to combine. – Add the rack of ribs and coat well with the marinade. – Cover the tray with foil and seal tightly. – Pop it in the fridge for at least 3 hours, preferably overnight. – Heat your oven to gas mark 3 and then cook the ribs, still tightly covered for 2 hours. – Make a glaze by combining all of the ingredients in a bowl and whisking together. – When you’re ready to cook the ribs on the BBQ simply uncover them, brush all over with the glaze and pop on the hot BBQ. – Turn after about 5 minutes and keep brushing with the glaze turning to cook evenly. – In the meantime place your sliced nectarines on the BBQ. – Cook until everything is just a bit blackened with all of that great BBQ flavour. Now for the fish! I love cooking a whole fish. It’s just so much more fun, and it is just so easy. 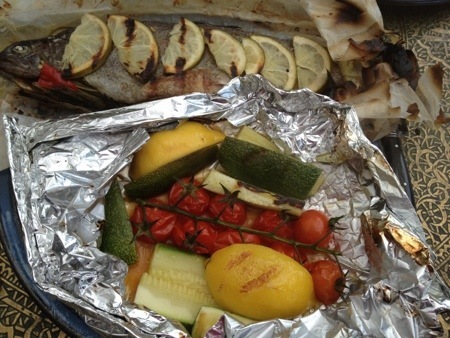 One of my favourite ways to cook any fish is en papilotte, wrapped in a paper parcel. My mum has been cooking salmon this way for as long as I can remember and it always seemed so stylish and grow up to me when I’d see her preparing it when I was a child. The advantages of cooking a fish this way are that you can impart a lot of flavour to the fish, it keeps it nice and moist, keeps the fish from falling apart and you get a lot of lovely juices full of flavour. I have made this dish with rainbow trout and mackrel and I think I prefered the mackrel. (We named him Malcolm.) It seemed to me that the flesh of the mackrel took on a lot more of the flavours where as the trout seemed more perfumed than flavoured. Mackrel is a meatier fish and oilier too but the trout was lovely and delicate. Either way this recipe worked brilliantly with both fish, so really, just get whatever whole fish your fishmonger has that you fancy. Just remember to get your fish gutted as we forgot to get the mackrel gutted and there was some delay while I YouTubed how to gut a fish, wimped out, and then had to wait for my dad to do it for me! I think I’d give it a go next time but let it never be said that I am not a wimp at heart, let the fishmonger do it! 1 trout or mackrel or other whole fish, gutted. – Take your fish and rinse it under cold water. – Pat it dry and lay on a sheet of baking paper with a row of lime slices underneath it. – With the side of a large knife crush/bruise the lemongrass, ginger, and galic cloves. Split the chilli in half lengthways. – Stuff the cavity of the fish with the lemongrass, garlic, ginger and chilli. 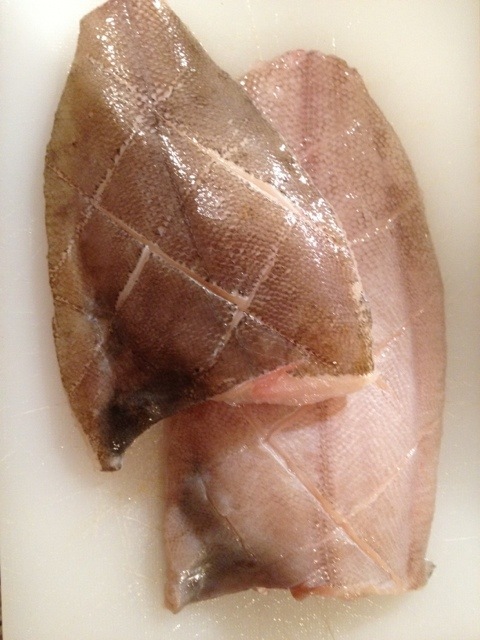 – Lay the remaining lime slices on top of the fish. – Season with salt and pepper and drizzle with olive oil. 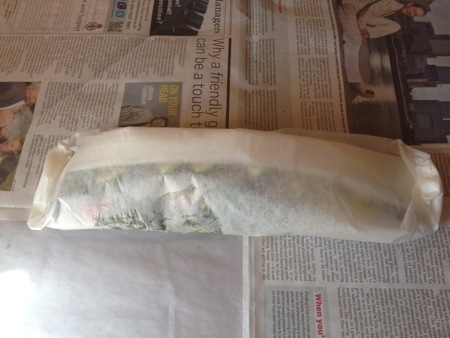 – Fold the baking paper around the fish to make a sealed packet. 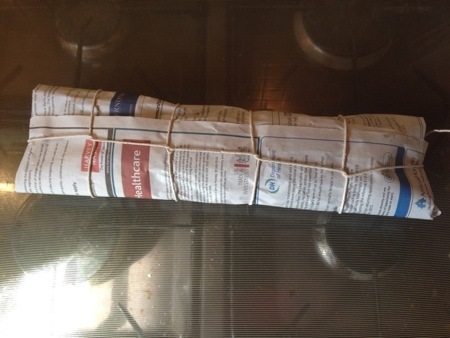 – Place on a large sheet of newspaper and wrap this securely and tidily round the baking paper package. Tie with string to secure. – Soak the parcel for about 3 minutes in a sink/bucket of cold water. – Place on a hot BBQ and cook for 45 minutes, turning halfway through. Be careful though as the newspaper may disintegrate and make a mess! 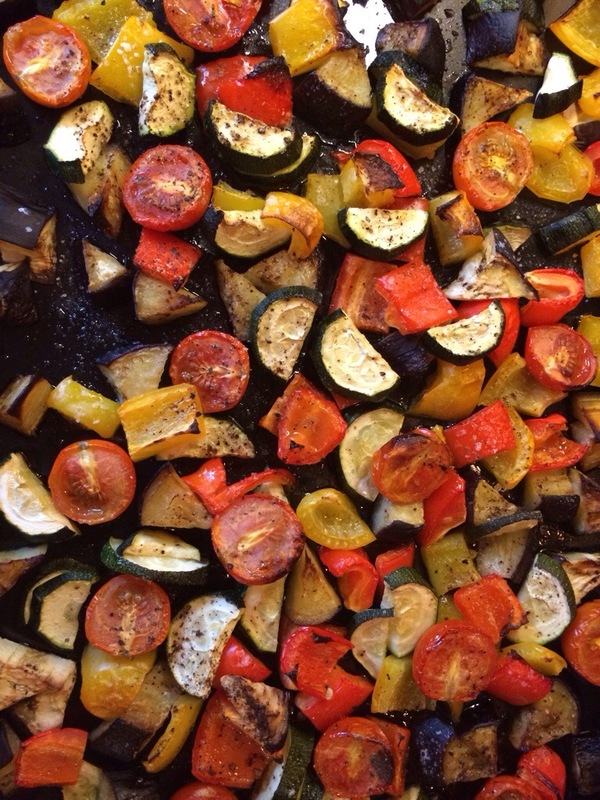 As for the sides, a parcel of roasted summer vegetables, sweetcorn on the cob and South African BBQ breads (the actual name of which I totally forget, saw it on the Food Network) work a treat. The roasted vegetable parcels create a lot of juices of their own and the bread is great to mop those and the fish juices up. Sweetcorn on the cob is just a summer essential, I love grilling it, you don’t need to precook it, just pop it on the BBQ and cook until slightly charred. You can brush it with soy sauce if you want to or simply serve with a sprinkle of salt. – Take a large sheet of tinfoil. – Place all of the vegetables in the lower half. – Drizzle with olive oil and season to taste. – Fold the top half over the lover half and fold up all of the open edges to make a sealed parcel. – Place on the BBQ and cook for 20-30 minutes. – Open the parcel by splitting the top open, being careful of all of the lovely juices inside. – Mix the flour, yeast, sugar and salt together in a large mixing bowl. – Make a well and pour in the oil and water. – Mix together to make a dough. – Turn out onto a floured worksurface and knead by hand for 10 minutes until smooth and pliable. It will be rather sticky but just keep it moving and try not to add too much extra flour. – Place in an oiled bowl covered in a warm, draft free spot and leave to raise for 1 hour or until doubled. – Knock down the dough and turn out onto a worksurface. – Divide the dough into four and shape into rounds. – Place on a board or plate and leave to rise for 20-30 minutes. – Cook on the BBQ turning after 10 minutes and cook for 10 minutes more on the other side. – Remove from the BBQ and tap. If the bread sounds hollow then it’s cooked. And now for dessert! After all of that faffing about you need something that is simple, no cook and that you can prepare ahdead. However, it still has to look great. I give you, the summer fruit flan! This is a wonderfully stylish cheat dessert. You can buy all of the ingredients and simply assemble a few hours in advance. 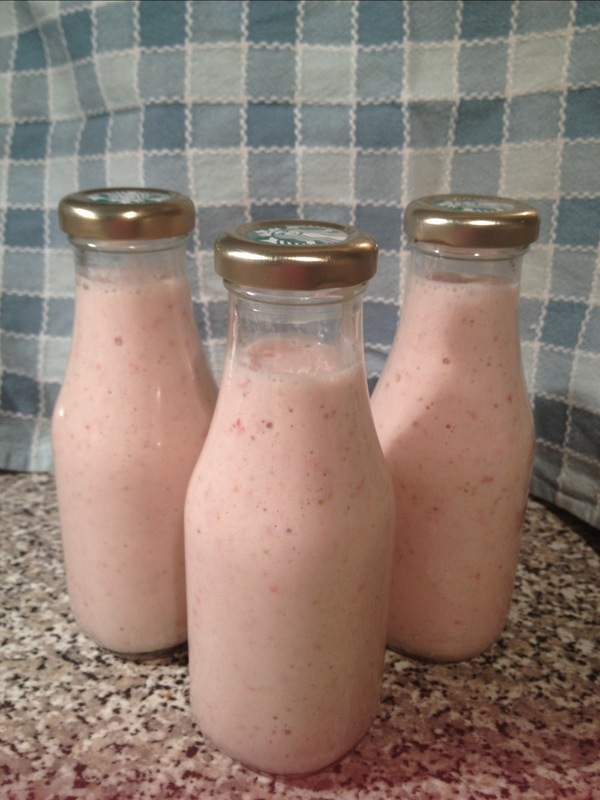 It will even keep in the fridge for a few days if necessary (while you wait for that elusive sunshine, perhaps!) but you’d need to use very fresh fruit. – Place thr flan case on your serving plate. 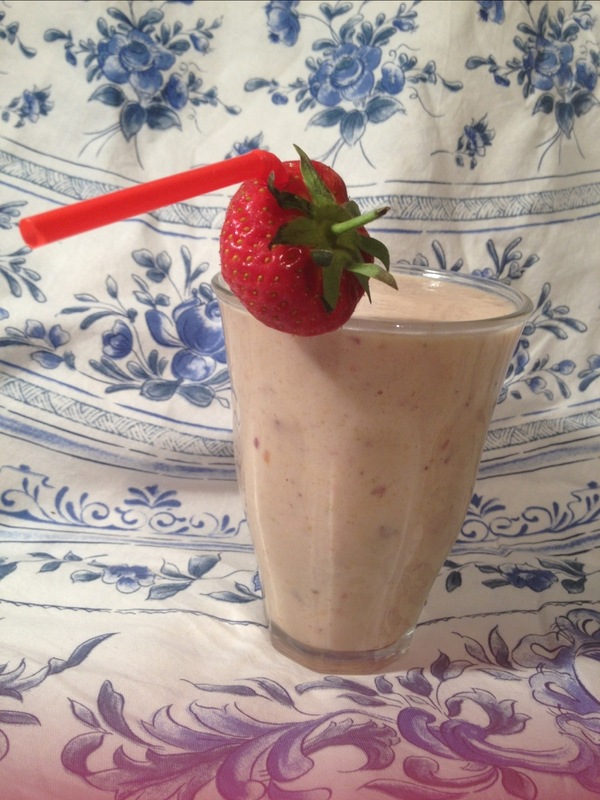 – Drizzle with any available fruit juices or a few tbsp of Framboise liqueur if you have it. – Spread the creme patissiere over the base of the flan. – Cover the top with fresh fruit. – Set aside for a few hours for the flan to soften, if you try eating it straight away it ca be a bit dry and crumbly. So there we have my summer menu to go with my stylish French wines! Hope you’re inspired to give some of them a go this summer. 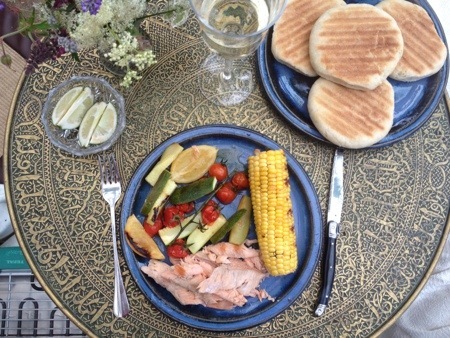 There’s nothing like eating and cooking al fresco, no matter the size of your gathering be it close family or a crowd of friends a bit of sunshine is always the perfect excuse to crack open a few bottles of French wine and laze away a few golden hours in the back garden with a Barbie! Bon appetit! My mother always tells us about holidays in Morecambe Bay as a child and how they would go treading for Dab. Sounds just like it is. You go walking about in the bay and when you step on a fish you don’t run screaming like a girl but instead you keep your foot on it and catch it for supper! Luckily I did not have to do that. This Dab came from Morrisons. When I was living in Tokyo during my gap year a local restaurant owner took it upon himself to educate us about the joys of Japanese food. It was our favouite izakaya and whenever we went there, in addition to whatever we had ordered, he would bring us something new to try. In return we helped him practice his English. 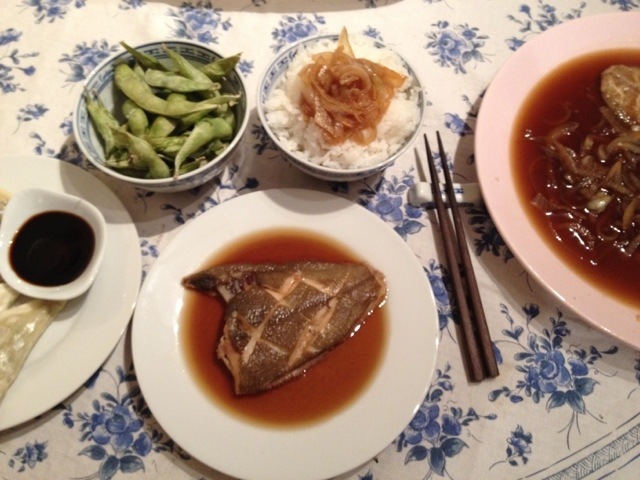 One day he presented us with a whole flat fish, simmered in a light soy stock. 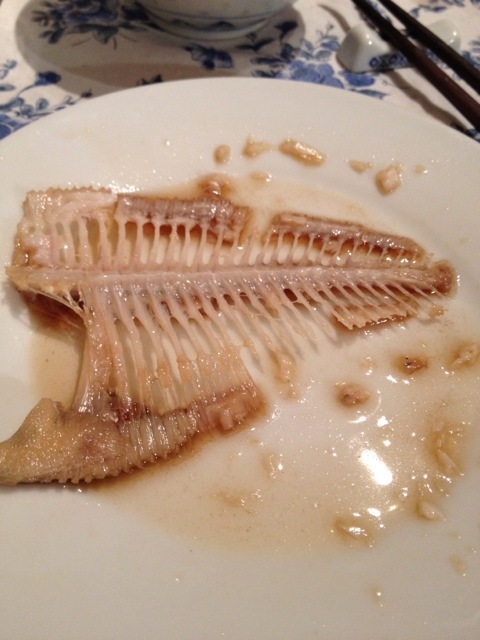 It was utterly delicious and a real biology lesson! Ever since I have been wanting to try recreating that dish. So, this Good Friday, I did. – Put all of the liquids in a pan big enough to place all the fish in flat in one layer and bring to a simmer. – Slash the dark skin of the fish diagonally with a very sharp knife. – Place the fish in the simmering stock, dark skin up, and cook for 4 minutes, ladeling the stock over the top occasionally. – Remove from the heat and place on a serving plate with a splash of the liquid and keep warm if doing the next step. 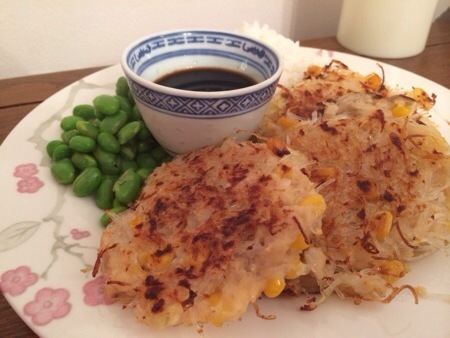 – Serve with sticky rice and any other Japanese dishes you fancy. * Optional but very tasty. You don’t cook the onion and fish together because the onion flavour would overpower the delicate fish. This addition makes it a more substantial meal if you’re not serving anything else. One of the things I love about my mum’s kitchen is that there are always at least 3 pavlova bases ready to be assembled into whatever dessert we fancy. To round off our meal I had thought to serve a rhubarb sponge or tarte tatin but really wanted something a bit lighter. Mum suggested a pavlova and I am very glad that she did! 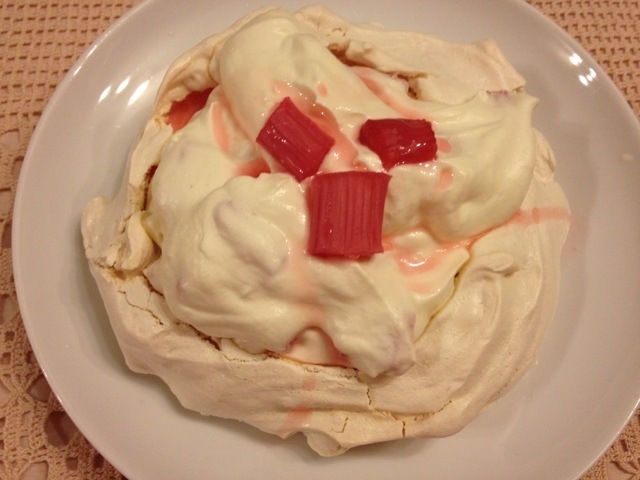 I am always a big fan of Yorkshire Rhubarb and, as always, the sharpness of the rhubarb is offset nicely by the sugar in the meringue. We served them as individual pavlova but you could assemble one large one if you prefered. – Chop the rhubarb into slices of 2cm or less. – Place the rhubarb in an oven proof dish and springle with the sugar. – Roast in the oven for 25-30 minutes. You want there to be plenty of juice and the rhubarb to still hold its shape. – Remove from the oven and allow to cool. – Drain the juice into a small jug. – Whip the cream until it just forms stiff peaks. – Fold the rhubarb through the cream, adding just a little of the juices to sweeten. Reserve a few pieces of rhubarb to garnish. – Pile the cream onto the pavlova bases. – Dot a few pieces of rhubarb on the top. – I like to leave them to stand for at least 1 hour to allow the meringue to soften under the cream. if you prefer a crisp meringue all through only assemble just prior to serving. – To serve drizzle the remaining juice over the tops.